WASHINGTON DC, WASHINGTON, UNITED STATES, June 28, 2018 /EINPresswire.com/ -- In this modern era, magento is considered as the most popular Ecommerce platform for almost every store. From medium to small commercial enterprises and large brands use magento for their ecommerce business needs all around the globe. Here, GoodFirms has distinguished the Top Magento Development Companies worldwide that helps the clients to develop their ecommerce website using magento platform with new features and functionalities. Magento is a flexible framework where the developers can certainly inculcate the latest key factors to make the ecommerce website speedy, effectual, flourishing, functional and performance-oriented. Today, there are many companies all over the world offering the magento service, so it has become significant that you hand over your project to a reliable, experienced and Top Ecommerce Development Company in UAE or to any other best firms nearby your location. At GoodFirms, you can reach expertise IT software companies from all different fields from worldwide that are listed after evaluating using a number of methodologies. 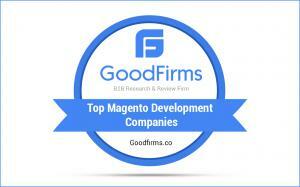 GoodFirms is an inventive B2B research and rating platform – a worldwide leader based in Washington, DC. This firm makes a scrupulous research for determining the top ecommerce development companies globally by identifying several parameters such as the overall performance of each company by verifying the portfolio, the market presence in ecommerce domain, the quality and ability to put up pioneering ecommerce portals, reliability to deliver the project on time and also take a quick view on client feedbacks to have a clear idea how much customer is satisfied by their work. Additionally, GoodFirms also invite the service providers to take part in the research process and get listed in Top Ecommerce Developers from any part of the world for free. Here you can also check out the new listing of Top Shopify Development Companies globally.